The second race off the year for the NASCAR Sprint Cup 2010 season, the tour was taken cross-country from Daytona Beach to the west coast state of California. Daytona 500 winner Jamie McMurray proceeded to the track at a more leisurely pace to the Auto Club Speedway thanks to a week-long press junket. This post-Daytona 500 media tour for Jamie McMurray made it even more impressive that McMurray skated his #1 Chevrolet to pole for Friday afternoon qualifying. With Earnhardt/Ganassi Racing teammate Juan Pablo Montoya starting on the front row, Montoya bypassed McMurray on the first lap of the race. The #42 of Montoya held the top spot through the first 29 laps. The Auto Club Speedway has become a stomping ground for Jimmie Johnson. Not only is the 2-mile oval located in the home state of the 4-time NASCAR Sprint Cup champion, his Lowes sponsored #48 Chevrolet holds an average finish of 3.75 in the last 8 races held on the Penske-built speedway situated on former Fontana industrial land. Johnson's presence emerged early in the Auto Club 500 as he took 1st place away from Montoya on lap 30. Caution-free for 58 laps, the first caution came out for debris on the racetrack. While the Sprint Cup teams were able to change tires and refuel under the lap 59 caution, a multitude of green flag pit stops contributed to many of the 26 lead changes through the event. 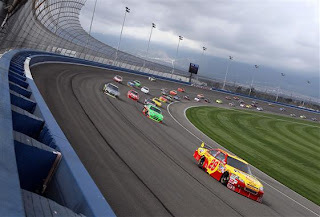 However, regardless of caution or green flag period, too many drivers and teams at Auto Club Speedway were confronted by NASCAR's aggressive policing of pit road. With 15 penalties levied against Danny Hamlin, Juan Pablo Montoya, Dale Earnhardt Jr, Kevin Harvick and others, one incident involved Kevin Harvick's car and a pit crew member of the #1 team. As Harvick's #29 car was leaving pit road on a lap 94 stop, a tight exit resulted in Harvick launching into the path of a crew member and a tire from Jamie McMurray's #1 Bass Pro Shops team. Like Nintento's Mario, the crew man leaped over the hood of the #29 Shell/Pennzoil Chevrolet avoiding injury. However, the #1 team was penalized for the loose tire and the #29 Chevrolet took a penalty for speeding out of pit road. After many drivers posting strong finishes at the Daytona 500, the Auto Club 500 saw many of those drivers endured a much harsher followup race. While McMurray started on the pole for the event, he lost ground after a pit stop penalty for the before-mentioned incident and was unable to mount a return to the front. McMurray finished 17th on the day finishing ahead of his teammate Montoya who had his engine parish after 140 laps. Coming off a 2nd place run, the recent string of misfortune seemed to have lifted off Dale Earnhardt Jr and the #88 Amp/National Guard Chevrolet. The Auto Club Speedway, historically one of Earnhardt Jr's worst tracks, was a bump on the road of the #88 Hendrick Motorsport team's resurgence. Caught speeding on pit road early, Earnhardt Jr began a recovery before a later pit stop resulted in a broken axle half-shaft. While the Hendrick Motorsports crew succeeded in placing Dale Earnhardt Jr back in the event, the #88 Amp Juice Chevrolet come home 12 laps back in 32nd place. While a less than stellar run overall, this is sadly Earnhardt Jr's best finish in the Sprint Cup season's 1st Auto Club Speedway race since driving for Hendrick Motorsports. While Earnhardt, McMurray and Montoya had good finishes at Daytona, Ryan Newman, Kasey Kahne, and Marcus Ambrose are skilled drivers starting off the year with lackluster results through the first 2 races. Ryan Newman's car lost an engine to finish 36th while Kahne fared better by at least running after a down day started by a slide through the in front grass. He placed 34th on the final race result. Ambrose's Toyota was sandwiched between the two suffering from overheating issues. Into the final laps, racing fortune again shined on Jimmie Johnson as a caution came out almost instantly after he took the #48 Lowes Chevrolet down pit lane. By doing so, Johnson was able to leapfrog the field as they required the attention of pit road service and would start the race in the lead. 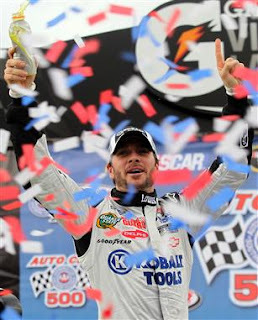 Despite a heated challenge from Kevin Harvick, Jimmie Johnson held off the fight leading the final 24 laps to win his 48th Sprint Cup career victory and his first in 2010. By winning the Auto Club 500, Johnson wins a race at the speedway for the 4th straight year and his 5th all-time. Richard Childress Racing (RCR) cars driven by Harvick and Jeff Burton came home in strong 2nd and 3rd place finishes for the organization. After two races, premature analysis of the NASCAR Sprint Cup points has Kevin Harvick leading fellow RCR driver Clint Bowyer. Johnson's Hendrick Motorsports teammate of Mark Martin and the Joe Gibbs Racing Toyota of Joey Logano rounded out the top 5 for the NASCAR Sprint Cup Auto Club 500.